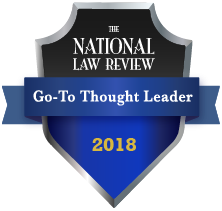 Jaffe CEO/Owner, Public Relations, Vivian Hood recently published the first of a two-part series in The National Law Review, “Law Firms and Cyber Attacks – What’s a Law Firm to Do?” Her article examines how breaches are affecting law firms, the steps to take, and responsibilities law firms and lawyers must have to help prevent cyber weaknesses. Susan Holmes, Manager LexSpeak and RankingsForLawyers™ was joined by Dawn Sheiker, Director of Client Relations at Morris James LLP on August 2 at LMA Philadelphia’s Small Firm/Solo Marketing luncheon. Expanding beyond U.S. shores and scoring big, international clients isn’t the exclusive domain of the large firms on Law360’s Global 20. The article, which appeared in the July 4 edition of Law360, discusses how it can make sense for most smaller firms that deal with almost any aspect of international business — transactions or litigation — to develop a presence overseas. Jaffe CEO/Owner, Public Relations, Vivian Hood recently guested on the "Creditors Rights In-Depth" podcast, a production of the National Creditors Bar Association. The episode, "Handling a Law Firm Data Breach," was recorded on May 8, 2018. In the podcast, Vivian shares insights and tips for law firms to help them prepare for, prevent and manage a data breach. Need to create analytics reports that won’t put people to sleep? Legal marketers are regularly tasked with providing objective data to back up their marketing initiatives. How we present that data to law firm partners, marketing committees, etc., can make or break future strategies and tactics. With Google’s free, easy-to-use tool, legal marketers can now make data much more digestible for key decision-makers. Senior Vice President, Public Relations, Carlos Arcos published an article in the May issue of ALM's Marketing the Law Firm newsletter. The article, "Is Your Firm Ready for PR? ", provides law firms interested in starting a public relations program with a primer on the tactic. Carlos covers the basics of PR, its benefits and whether a firm should make the choice to hire an outside agency to provide PR services, among other topics.